The combination of proper temperature and time duration in sous-vide cooking could provide good water-holding capacity, color parameters, and tender cooked meat. In this study, goat muscles gluteus medius (GM) and biceps femoris (BF) treated with single-stage sous-vide (cooked at 60 °C, 65 °C, 70 °C) and two-stage sous-vide (cooked at 45 and 60 °C, 45 and 65 °C, 45 and 70 °C) methods for 6 h and 12 h were compared. Cooking loss decreased by 5–10% for GM and 10–13% for BF after 6 h of heat treatment with two-stage sous-vide likely due to high sarcoplasmic solubility. Cooking time and temperature combination in two-stage sous-vide contributed to better a* values for both GM and BF, with higher values recorded for 6 h at 45 and 60 °C. Significant reduction of toughness was successfully achieved using stepped cooking temperatures compared with sous-vide cooking at a single temperature. The lowest shear force values were achieved at a combined temperature of 45 and 60 °C with only 6 h of cooking duration (GM 28 N; BF 40 N) likely from desmin degradation. However, the tenderness effect of single-stage sous-vide was seen after collagen solubility was maximized in prolonged cooking at 70 °C, but other quality features such as redness values and water content had recorded the lowest values. 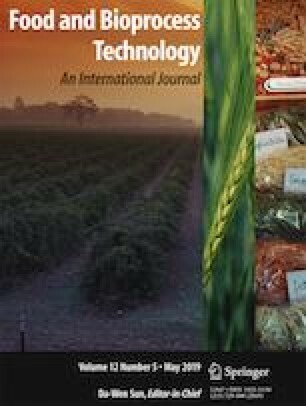 This research was supported by the Cooperative Research Program for Agriculture Science and Technology Development (PJ 01375601) from the Korean Rural Development Administration. ISO-3496. (1994). Meat and meat products – determination of hydroxyproline content. http://www.iso.org/ISO/catalogue. Accessed 1 February 2018.